Six miles east of historic Stirling, the village of Alva, nestling at the foot of the beautiful Ochill Hills (a walking mecca), plays host to one of the world’s most renowned breweries – Harviestoun. 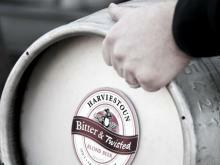 From humble beginnings in founder Ken Brooker’s kitchen, through corporate ownership and back to independence, Harviestoun remains among the true elite in the craft brewing world. 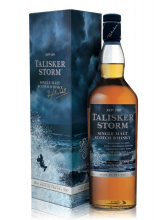 The latest release from Talisker distillery, Storm turns up the smoke and adds a touch more sherry to the mix. A big bold sea-breeze of a whisky, Ardbeg 10 fills your head with sweet smoke and wakes you up with a powerful, warming finish. Dubbed Black Oil by its good friends, this is a joy. Harviestoun's already delicious Old Englne Oil Porter is aged in Highland Park 12 Year Old casks, a sojourn which adds numerous layers of complexity. 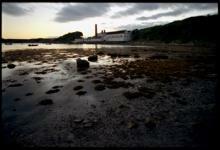 Heavy, even oily, and powerfully peated, Lagavulin 16 Year Old is a whisky which attracts devoted followers. 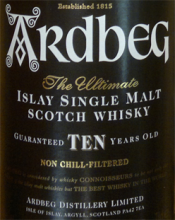 The robust palate and long woodsmoke finish makes it a great cold weather dram. In the past, before single malts became widely popular, Lagavulin was an important part of the White Horse blend, but these days it is prized more for its own unique flavours. 43%/70cl, around £47, widely available. Distillers often invoke the name of Robert Burns. It's hardly surprising. We toast his memory in whisky every January 25th. Burns wrote about whisky, he worked for a time as an excise man, he was fond of a dram. I wonder what he would have made of this one, from the Isle Arran Distillery? 40%/70cl around £30 from Master of Malt, the Good Spirits Co, and other specialist retailers. Vibrant red, with a substantial head, Melville’s raspberry lager is bursting with concentrated Scottish berry aromas with lots of maltiness to support it. Made by those talented chaps at Innis & Gunn, real lager flavours come through on the palate, and the full-bodied texture is very pleasant. This could easily be deemed a raspberry equivalent of a lager shandy, and is a far cry from some of the simpler fruit flavoured fermented beers and ciders on the market at the moment. Dougal Sharp, CEO of Innis & Gunn, was inspired to dig up the old Scottish tradition of spiking porter with treacle when he came across a reference to the practice and a 100 year old recipe in the Scottish drinks history book, A Scot’s Cellar, by Florence Marion McNeill. And so he did it, and it’s worked incredibly well. 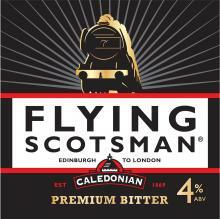 We're in traditional bitter territory with this offering from Caledonian – there’s not a flashy hop in sight. And that’s certainly not a slight. An assuringly traditional nose includes some roasted/toasted notes of nuts and coffee and caramel, all rounded together beautifully. An appealing dark copper in colour, this ale has a clean finish and leaves you thinking of hazelnuts.